Who will be the tactically better gourmet in this game for two? Gather some mushrooms and cook them with butter and cider. Don't forget a basket and avoid the fly agaric! I bought this off the back of watching some video reviews for the game 'Morels' which is extremely highly thought of as a great 2 player card game. This game is pretty much a reprint with revised artwork and slightly different components. The new artwork is more 'realistic' and is extremely high quality, in fact the production values of the game are excellent all round. The scenario is that you are walking through a woodland looking for mushrooms/fungi and trying to collect the best sets in order to fry them and gain 'victory points'. The game plays with a line of cards and you can take only the end 2 cards, which represent the area of woodland by your feet. The line of cards is constantly moving along like a conveyor and the players face a lot of difficult strategic decisions as they decide which cards to pick up and which to let go into the 'decay pile', which their opponent might like the look of and collect! 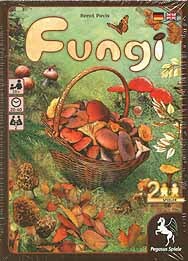 The theme actually is quite strong and draws you in as you look for the rarer fungi cards to complete your set! There are some nice extra touches such as the 'night' cards (which can give you double the mushroom value) and the cider and butter cards, which can really improve your score but you have to collect more cards of the same set! This game packs a really big punch for it's diminutive size and the perhaps strange title and theme, but rest assured, the game plays fantastically well and presents some incredible value gaming. Having collected a number of 2 player games now, I would put this right up there with Lost Cities, Battle Line, Jaipur etc... If you're looking for a decent player card game, then look no further!